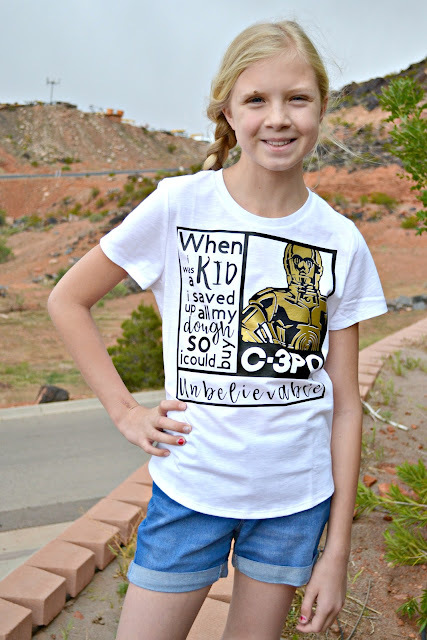 Cricut just came out with Star Wars images to purchase and we've been having a little too much fun with them! 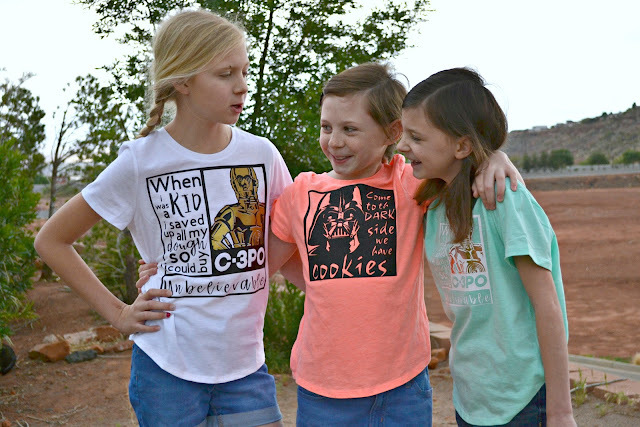 The kids needed some more t-shirts and they loved the idea of Star Wars ones! 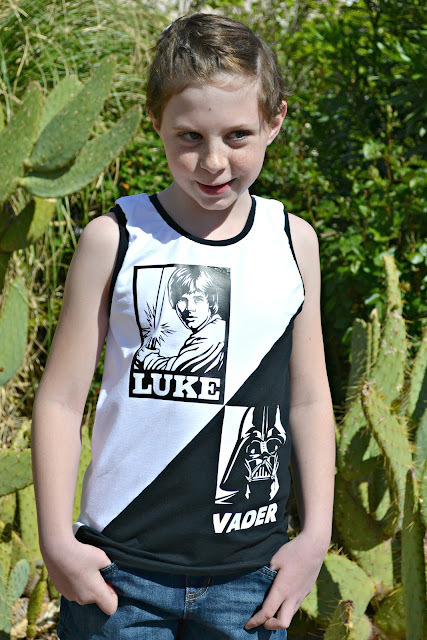 The first shirt we made was using LUKE AND VADER and Titchy Threads Twisted Tank in black and white knit. 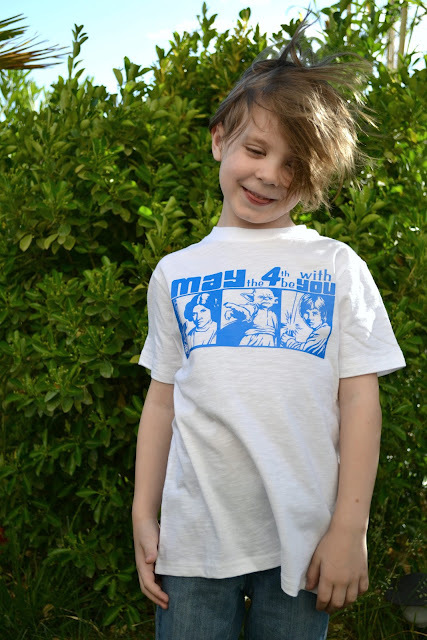 The vinyl is Cricuts black and white iron on. The white fabric is from Riley Blake Designs, and the black fabric is from Art Gallery Designs. All of the Star Wars images need to be purchased in Cricut Design Space to make and are not part of Cricut Access. The second shirt is using R2-D2 and I didn't make any changes to it since Aevs liked it just how it is. The vinyl is Cricuts Glitter Royal vinyl, which of course Aevarie loved! 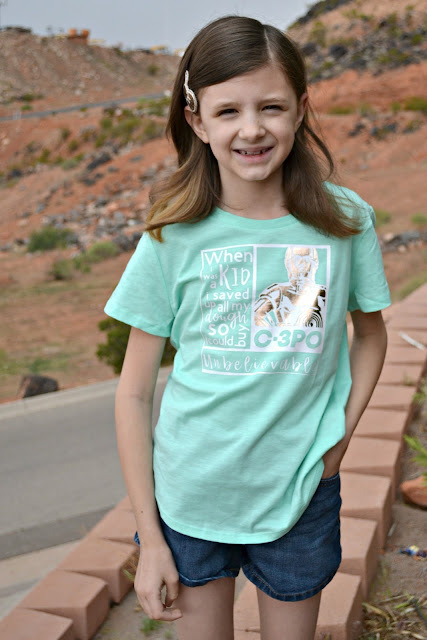 Since we're staying with family right now, I haven't had too much time to sew, so I did go and get some plain t-shirts from Target. I know, I know. I still have two more Star Wars Themed things I am sewing up though! 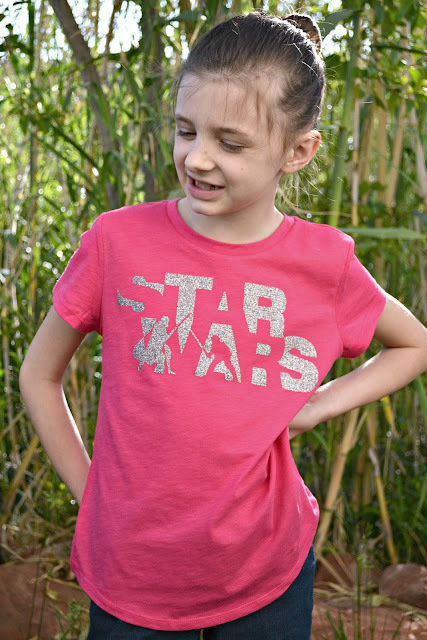 The third shirt is just Star Wars. Paisley wanted the one with them fighting. We used Glitter Black Silver vinyl for it. 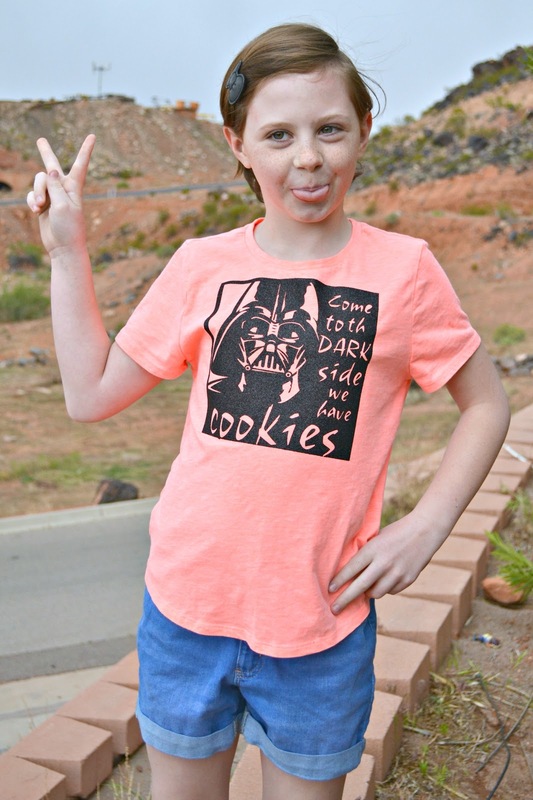 Jude wanted a Yoda shirt. 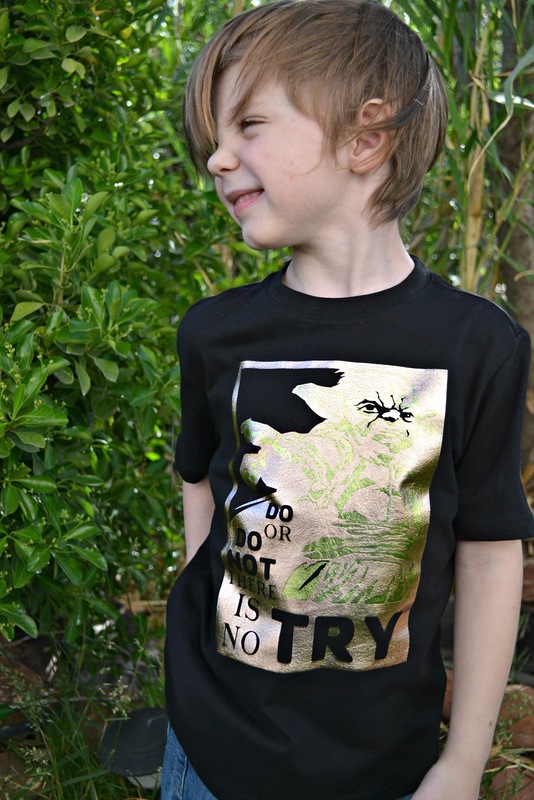 I used Light Gold and Lemon grass Foil vinyl on it. 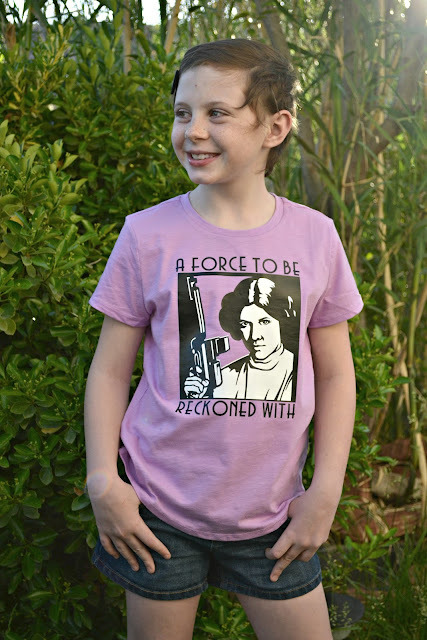 So this girl.....she is FOR SURE a force to be reckoned with, so the Leia shirt was definitely in order! Vinyl is Cricuts Black and White iron on. For Aevs I used regular black iron on and gold. Paisley's is out of the white and gold. I may have already made a trip to Joanns to grab some more black vinyl and apparently I should have grabbed two rolls! 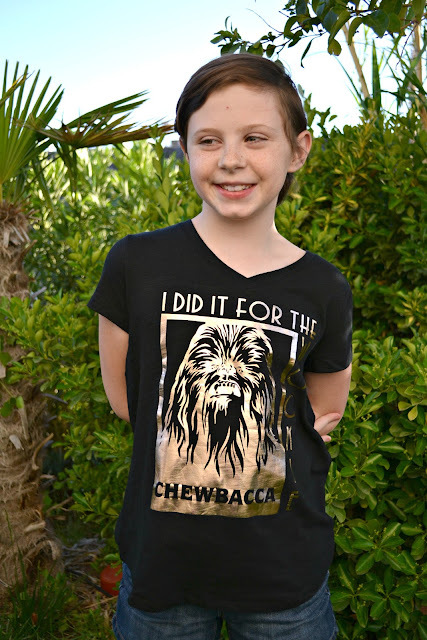 Of course Zoe being Zoe, we chose "I did it for the Wookie" using Gold iron on. Remember how I just said she wanted to be evil?? She had to have a "Dark side has cookies" shirt! We used Black Glitter iron on because that's just more glamorous! Last (for the moment) is May the 4th be with you. I used Blue iron on vinyl for it, so this guy is already for May the 4th! 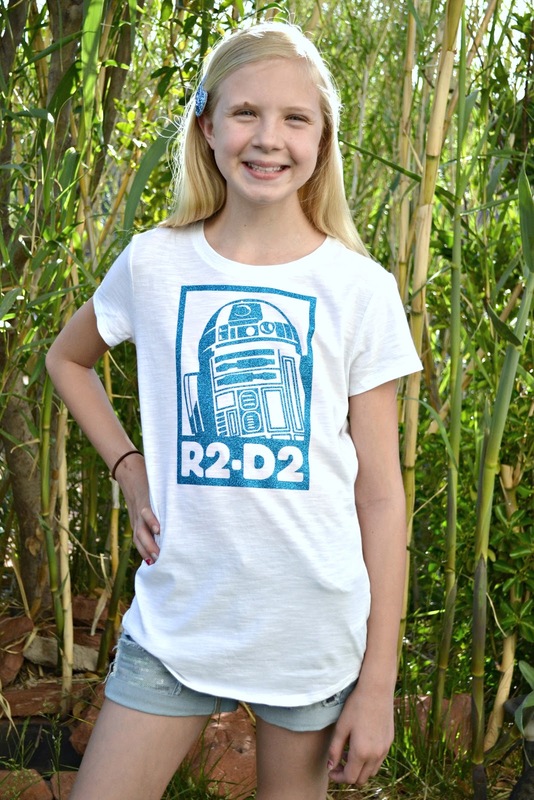 I do still have a Star Wars Solis dress and a t-shirt for me in the works! I hope you all have a fantastic May the 4th!